St Cuthman’s name occurs in several early medieval calendars and in the old Missal that was used by the English Saxons before the Norman conquest (kept in the monastery of Jumièges, in which a proper mass is assigned for his feast), a German martyrology clearly indicates a pre-Conquest cultus, and the church at Steyning seems to have been dedicated to him in the past. Saint Edward the Confessor gave the Steyning church to Fécamp, which monastery built a cell of monks on the site of his old wooden church and built a new one dedicated to his memory, although Cuthman’s relics were translated to Fécamp. The information on Cuthman preserved there may contain some genuine material. 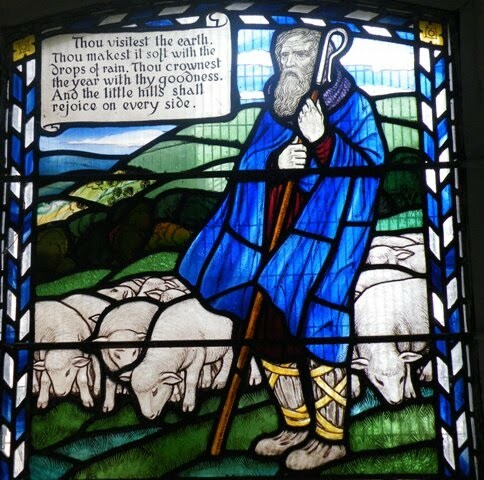 In art, Saint Cuthman is always shown among sheep because he was a shepherd of Steyning (Roeder). He feast is kept at most Benedictine monasteries in Normandy (Husenbeth). There is a German engraving of him with his “cart” dated about 1450 and a choir seat carving at Ripon Cathedral dating from a few decades later. And at Chidham, where he was born, there was a Guild of St Cuthman, which was subject to a tax in 1522 under Henry VIII. Finally in 1658 the Bollandists transcribed and printed his Life, giving his feast day as February 8th. O God, you brought the soul of the blessed virgin Scholastica to heaven in the form of a dove in order to bring to our notice her life of innocence. Through the prayers and merits of Your saint may we live such a life that we too may attain everlasting happiness. Defend us, we beseech Thee, O Lord, from all dangers of mind and body: and through the intercession of the blessed and glorious Mary, ever Virgin, mother of God, of St Joseph, of Thy holy apostles, Peter and Paul, and of all the saints, in Thy loving-kindness grant us safety and peace; that, all adversities and errors being overcome, Thy Church may serve Thee in security and freedom. Through Jesus Christ, thy Son our Lord, Who liveth and reigneth with thee, in the unity of the Holy Ghost, ever one God, world without end. R. Amen. I have chosen to be an abject in the house of my God, rather than to dwell in the tabernacles of sinners. V. And hast set him over the works of Thy hands, O Lord. Blessed is the man who hath not walked in the counsel of the ungodly, nor stood in the way of sinners, nor sat in the chair of pestilence. But his will is in the law of the Lord: and on his law he shall meditate day and night. And he shall be like a tree which is planted near the running waters, which shall bring forth its fruit in due season. And his leaf shall not fall off: and all whatsoever he shall do shall prosper. May this sacrifice of Thy dedicated people be accepted by Thee, O Lord, in honor of Thy Saints: to whose merits we attribute the help afforded us in tribulation. Graciously hear us, O God our Saviour, and, by virtue of this Sacrament, defend us from all enemies of soul and body, bestowing upon us Thy grace here and Thy glory hereafter. Through Jesus Christ, thy Son our Lord, Who liveth and reigneth with thee, in the unity of the Holy Ghost, ever one God, world without end. Thou hast filled Thy household, O Lord, with holy gifts: do Thou cherish us always, through the intercession of her whose festival we are keeping. May the gift of this Divine Sacrament which we have offered, cleanse us and defend us, we beseech Thee, O Lord; and through the intercession of the Blessed Virgin Mary, mother of God, of St. Joseph, of Thy holy apostles Peter and Paul, and of all the saints, free us from all iniquity and deliver us from all adversity. Through Jesus Christ, thy Son our Lord, Who liveth and reigneth with thee, in the unity of the Holy Ghost, ever one God, world without end. R. Amen.